Prof Alfred Msomi, Acting Dean of the Faculty of Natural Sciences, proudly made an announcement at the last Senate meeting of Dr Lungi Kwitshana’s rating as a C3 researcher by the National Research Foundation (NRF). MUT is also proud to see one of its first alumnus receiving this recognition. Dr Kwitshana is registered as a Medical Scientist with the Health Profession’s Council of South Africa (HPCSA) and is also a member of the South African Immunology Society. 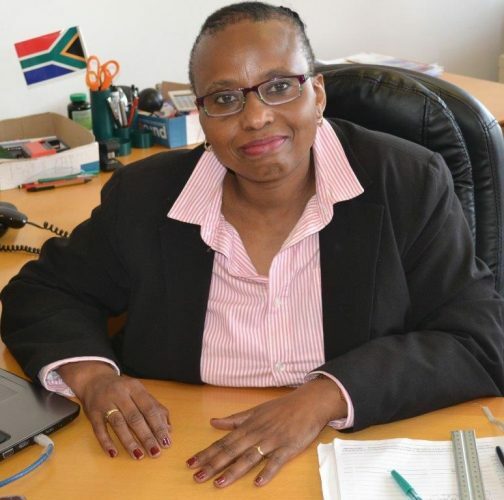 Armed with the MUT National Diploma in Medical Technology (Clinical Pathology) she received in 1987, Dr Kwitshana has come back to MUT full-circle. Dr Kwitshana returned to MUT in 2015 as Head of Department of Biomedical Technology and her research output has grown immensely. Dr Kwitshana has published 16 peer reviewed journal articles, two book chapters, a book, and 22 conference abstracts. Dr Kwitshana has been a Principal Investigator in several research projects that researched the intersection between immunity, nutrition and co-infections with HIV, and attracted millions in grant funding. Dr Kwitshana also serves as a reviewer for Master’s and PhD protocols. Dr Kwitshana has a national and international academic footprint. She was appointed by the Minister of Health to serve two terms as a Board Member of the South African Medical Research Council (SAMRC). Dr Kwitshana is an editorial board member of several international journals. She also serves as a reviewer of international journals. She is a recipient of the UK CIA Immunology Fellowship. Dr Kwitshana is a co- founder of the National Parasite Control. She was appointed by the Director-General for Health to serve as a member of the NTD Forum. Dr Kwitshana has supervised to graduation Honours, Masters and PhD students. She serves as a reviewer for NRF, DHET and other national institutions. In 2017, MUT recognised Dr Kwitshana during its Annual Research Awards evening with a Gold Award for the greatest number of publications and a Silver Award in recognition of a researcher with the highest funding in 2017. The NRF rating affirms years of hard work in research and research mentorship. MUT Senate congratulated Dr Kwitshana for this great achievement.